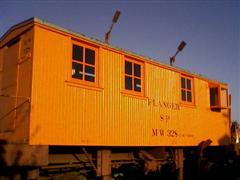 Snow Flanger SPMW #328: Built for the Southern Pacific in the 1940s, donated by SP to the Chapter October 1981. Donation stipulates Snow Flanger not to be used for any railroad related purposes. One of the last wooden-bodied flangers in existence. Modified to be operated remotely. Roof and interior are in good shape. Exterior sides and running gear are in bad shape. Length, coupler to coupler: 37' 6". Flangers were used for removal of snow and ice from track flange ways moving at relatively high speeds. Flangers have two steel blades that are lowered between the rails. One blade throws snow to one side of the track, while the other blade does just the opposite. The springs have been removed from the trucks to prevent the Flanger from moving up and down while the blades are lowered. If the flanger did have springs, the blades could drop deep enough to damage the track structure or derail the Flanger. The SP Flangers are not bi-directional, so they need to be turned on either a wye or turntable. Friction bearing and non-functional, LTWT 44000. The lack of suspension inhibits movement, de-rails have happened during short movements. The Pentrex Southern Pacific Film Archives Volume II, Flangers, Spreaders & Steam Rotary Snowplows has excellent footage of a flanger in action. In cooperation with OERHS this rare device is being placed on display at APMA in Brooks, Oregon.